Happy Fourth of July! It’s really nice to be saying that from home in San Francisco. I’m crossing my fingers that fireworks tonight will not be impaired by the fog…but on July 4th, that is notoriously San Francisco! 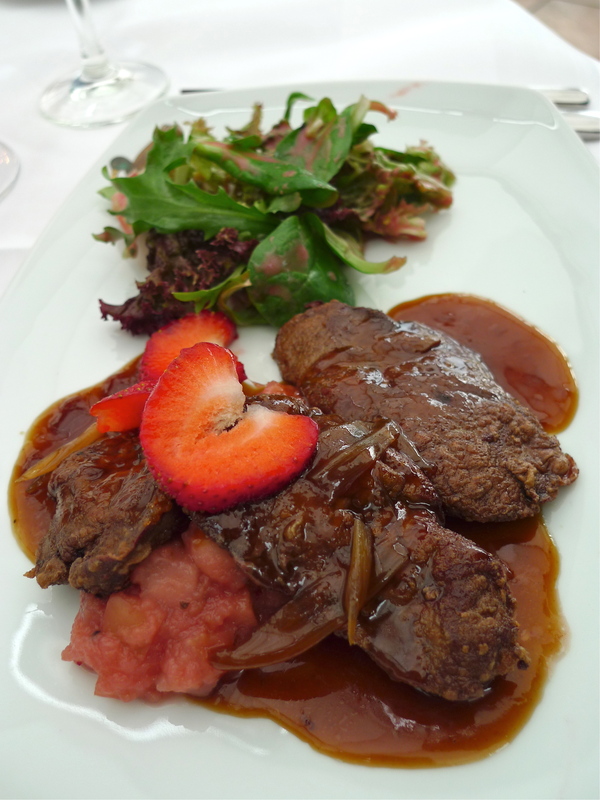 On the evening of bf’s birthday we dined at the charming, family-run, Restaurant Landgasthof Brechtmann, in the neighboring town of Schürsdorf. As it is situated off the beaten path deep in a residential neighborhood, I’m not sure how tourists could possibly find this gem of a restaurant. But, let me tell you, it is worth the hunt if you’re ever in the vicinity. 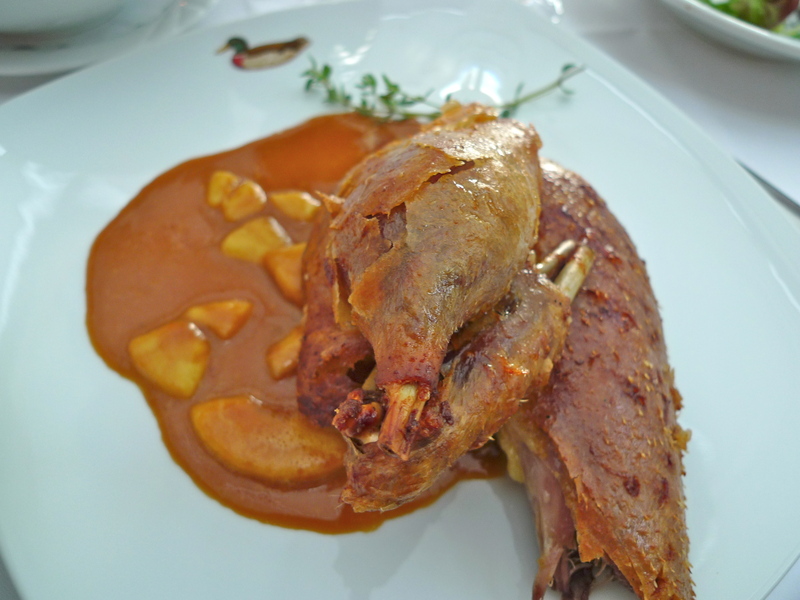 The specialty of the house is muscovy duck sourced from Lower Saxony and they are cooked to absolute per-fec-tion! 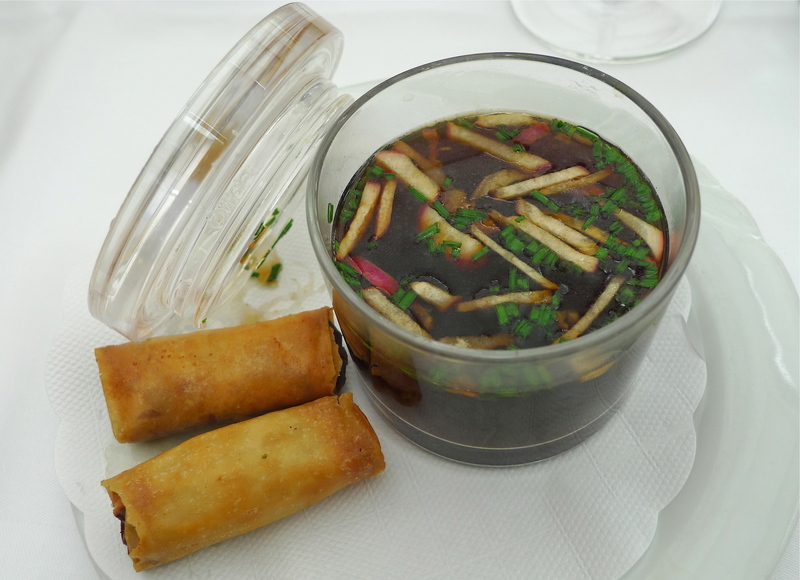 I started with Entenkraftbrühe mit Sherry und knuspriger Frühlingsrolle – duck consommé with sherry & duck fried egg rolls. It really hit the spot as I was sporting a little cough that evening. Bf’s appetizer was gebratene Entenleber über Apfel-Pfeffer-Kompott mit buntem Gartensalat – roasted duck liver over apple compote with fresh garden greens. We always taste (and sometimes take over) each others food, so this was exactly what one would expect…artery clogging goodness. 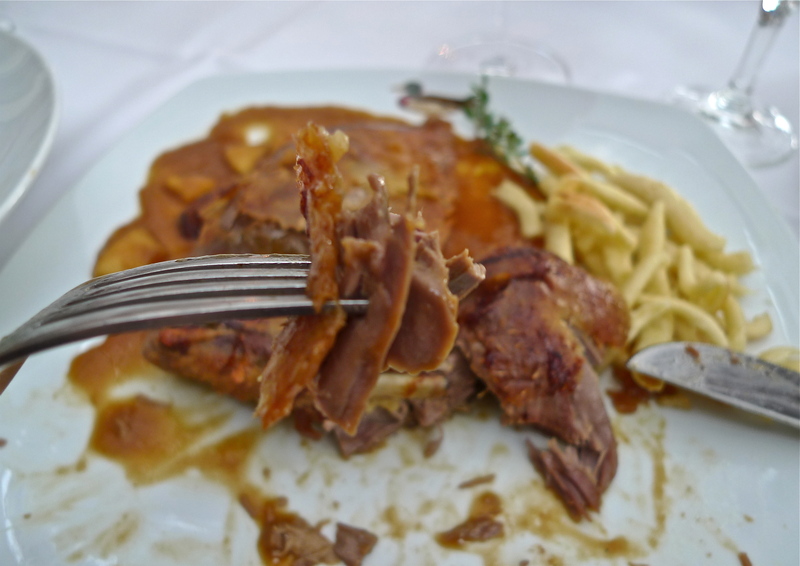 We chose the same entreé, 1/2 Ofenfrische Flugente „KROSS GEBRATEN“ an Calvadosrahmsauce mit gemischtem Salat und Kartoffelrösti – 1/2 fresh from the oven muscovy duck with calvados sauce and noodles (or spätzle). Calvados is a apple brandy. You can imagine how well this sauce pairs with duck. 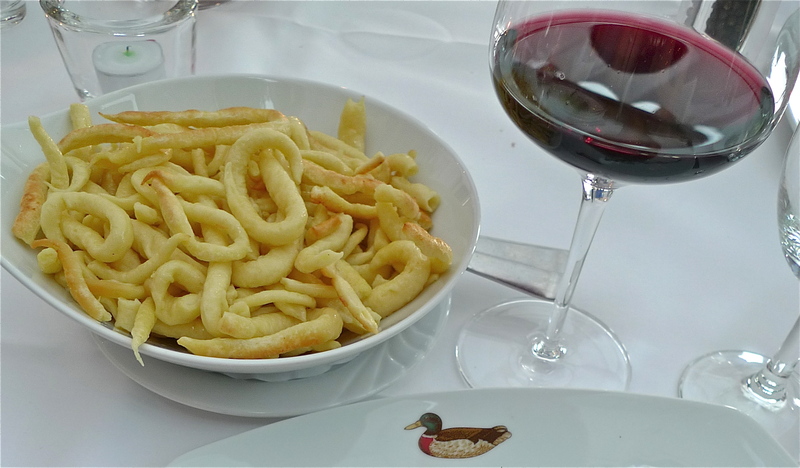 Also, this was, hands down, some of the best spätzle I have ever had – tender and buttery, with crispy bits. They carve the duck table side lickety-split! Since we had small children with us, we ended our fabulous meal at the restaurant to return home for…more cake. More. Yup, that’s how we roll (pun intended). 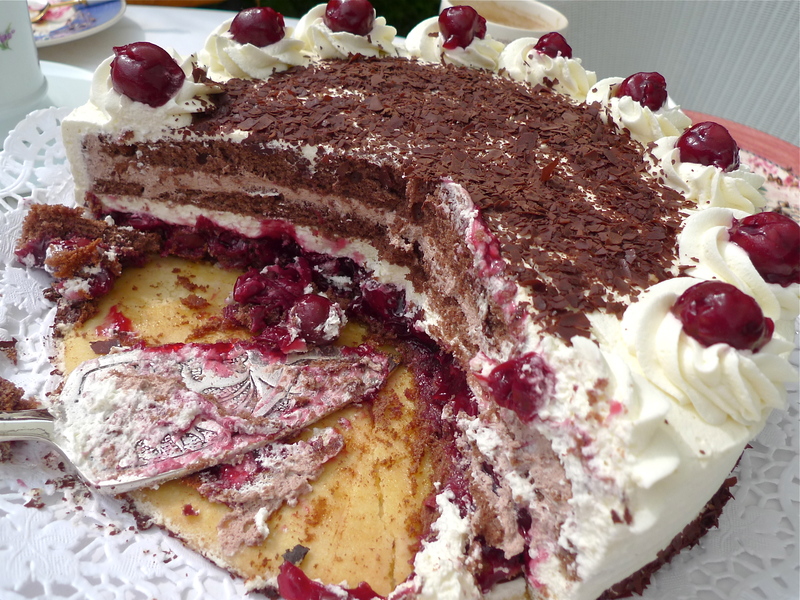 Black Forest Cherry Cake or Schwarzwälder Kirschtorte. Please don’t confuse this with German chocolate cake (nothing against it, just not to my taste). 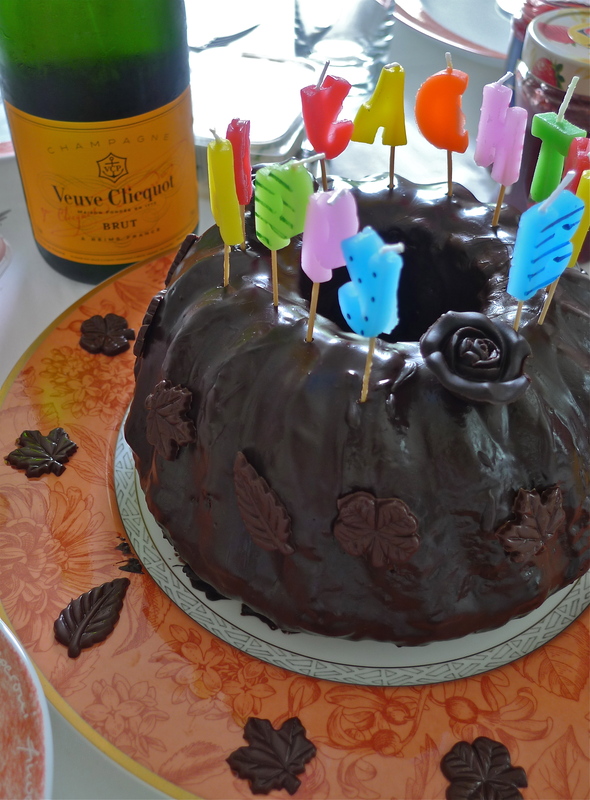 This cake is eleganty light and, surprisingly, not too sweet. Fantastic! Coming from someone that does not normally have a sweet tooth, I ate a slice of this cake 3 times in the span of 5 days. Before I proceed, I’d like to share with you that I lost a few pounds prior to this trip to Germany. Don’t fret…this was done in preparation for the abundance of food that is typically consumed when I visit bf’s darling mother. She is the consummate hostess and we are lovingly indulged upon our arrival. It all begins on the first morning. We wake up to a beautifully set table and a lavish German breakfast. On this morning we are also celebrating my dear bf’s birthday! Interesting tidbit, note the “Happy Birthday” candles on the cake? No, this was not for the sake of the non-german speaking girlfriend. Happy birthday in German looks like this, “Herzlichen Glückwunsch zum Geburtstag“. Seriously. So, for obvious reasons “happy birthday” is commonly used. 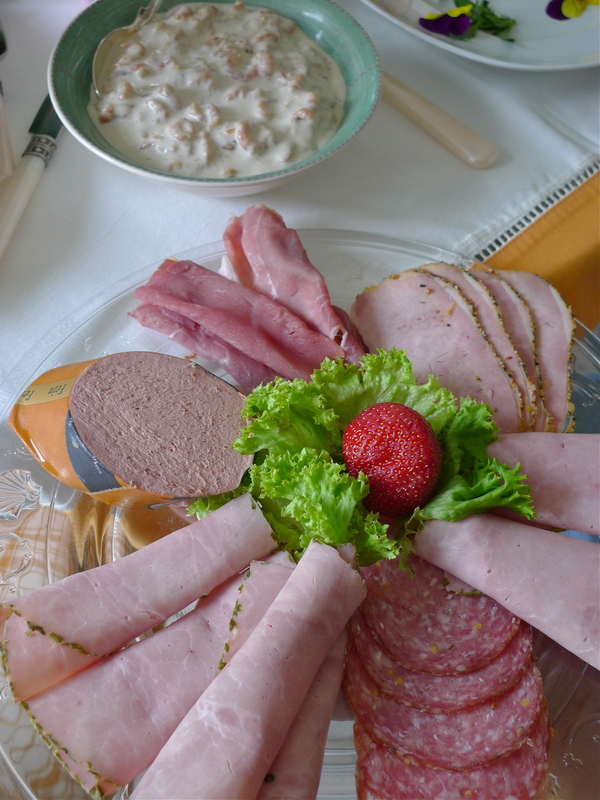 Our typical German breakfast includes brötchen (bread rolls), marmalade or jam, cheeses, ham, salami and sausage of different variety…and more bread. 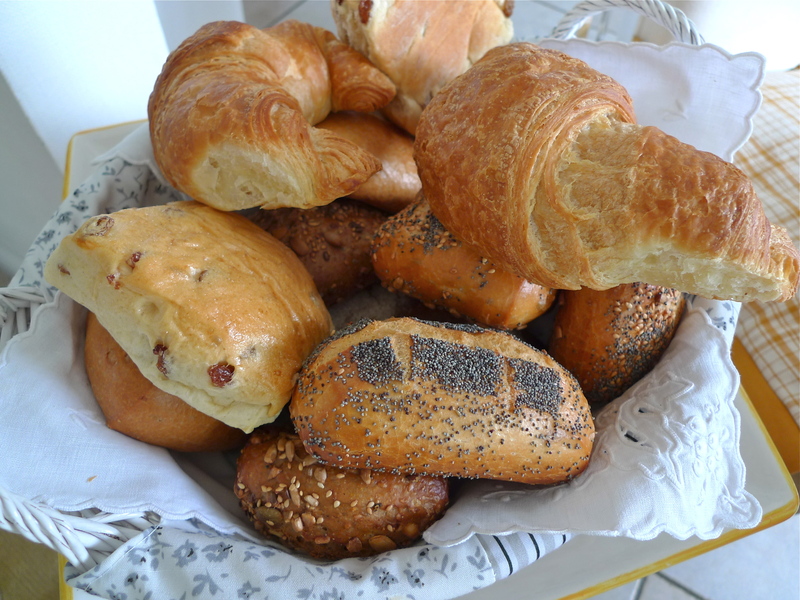 Germans have hundreds of types of breads and bf’s darling mother basically brings in a fresh bakery every morning. Another special touch, is Nordseekrabbensalat (bowl in the photo below), which is a mayonnaise based salad made with tiny shrimp from the north sea. The first time I came to visit, I expressed how much I enjoyed this sweet shrimp salad and bf’s darling mother now has a fresh, plentiful supply when we visit. It is not safe for my thighs to express any of my likes in this household, but a heartfelt dankeschön to my dear hostess!